Live Below The Line challenge – please join or sponsor! I think everyone will agree that, in this day and age, there’s not really much you can do with £1. The truth, however, is that surviving on this small amount per day is the reality for the 1.4 billion people around the world who are living below the extreme poverty line. 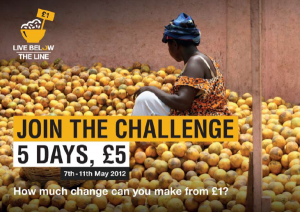 Live Below The Line is a fundraising campaign created by the Global Poverty Project, and which will run from May 7th – 11th 2012. During this week, thousands of people across the UK will get sponsored to live on just £1 for food per day for 5 days to raise money and awareness for the 1.4 billion people around the world who are currently living in extreme poverty. I’m taking part in this year’s Live Below The Line campaign – and for someone who loves their food as much as me, this really is going to be a challenge. Spending a maximum of £5 for five days, when this amount is less than I’d normally spend in a day, is going to be tough. 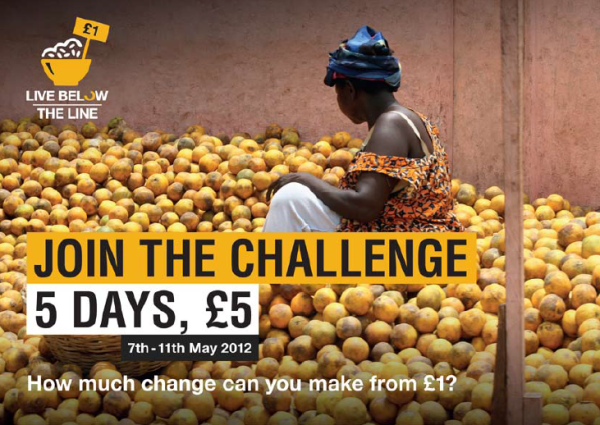 Even tougher, in fact, when you read the rules of the challenge: the full cost of all items must be included in the budget, no combination of meals on a given day can exceed the £1 limit, no grabbing snacks that are already in your cupboard…and the £1 budget also includes the purchase of cigarettes. This is going to be difficult! I’ll be blogging about my progress when it gets to the week of the challenge – but before then, I’d like to make a shameless plea for sponsorship. The main reason I’m doing this is to raise money for Health Poverty Action – a charity whose mission is to tackle poverty and improve the health of mothers, newborns and families in the poorest communities worldwide. One Response to Live Below The Line challenge – please join or sponsor!